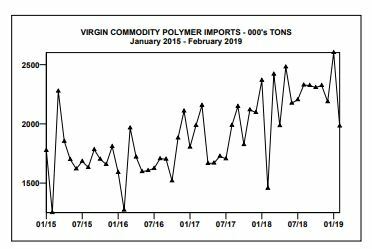 Imports of polyethylene, all grades, totaled 2.9 million tons, up 24% through February. Propylene polymer imports were 806,000 tons, up 7%; styrenic polymer imports were 616,000 tons, up 21%. Imports of all of these polymers from both Middle East and Asia-Pacific sources were up; imports from North America declined. Western Europe supplied more polyethylene and polystyrene than in the prior year, but shipped less polypropylene. From International Trader Publications’ China Polymer Trade Report, a monthly online publication analyzing China’s imports and exports of all commodity polymers, recycle polymers and large-volume fabricated plastic products.